Formula One's governing body accused the Mercedes team on Thursday of breaking the rules by testing in Spain with tyre supplier Pirelli last month and benefiting from their involvement. Mercedes, the team of 2008 world champion Lewis Hamilton and Germany's Nico Rosberg, could face heavy sanctions if found guilty by a tribunal meeting at the International Automobile Federation (FIA) headquarters. Mark Howard, the FIA's legal representative, opened the hearing by telling the four judges and tribunal president Edwin Glasgow that there is little factual dispute in the case presented to them. Howard said their action is a clear breach of the ban on teams testing during the season with a current car. "There is not much room for doubt that the Mercedes 2013 car was a car covered by the regulations and that the car was subjected to track running time in Barcelona," he said. "Track testing is deliberately defined as track running time," Howard explained. "It is a term used deliberately because it is unambiguous ... any running on the track is deemed to be testing." Howard said that Mercedes would have gained valuable information from the test, even if only to highlight some hitherto unknown defect with the car. 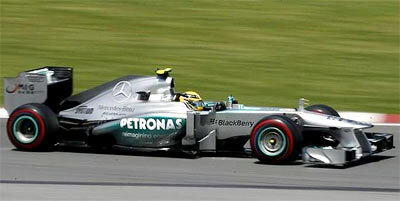 "It is difficult to say that Mercedes gained no benefit from the test," he declared. The tribunal heard that Meadows spoke to FIA technical head Charlie Whiting on May 2 to ask whether testing with a 2013 car was permissible. Brawn then made a similar enquiry in a telephone call later that day, said Howard. "What is very odd about all of this is that on the basis of the telephone calls, both Mercedes and Pirelli went ahead without getting back to Mr Whiting and making clear precisely ultimately what they were intending to do," he added.